An e-mail informing us of Bobby's sudden passing came as a shock. and it helps somewhat to jot down some of these anecdotes from a much happier time. 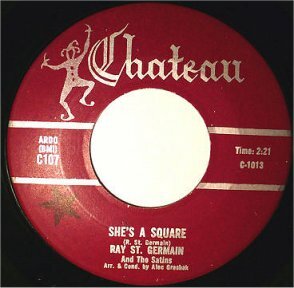 I was excited when two Canadian teenagers recorded hit 45s at the end of the '50s - I bought them both. 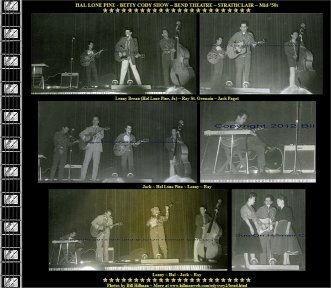 I saw Ray in Strathclair Bend Theatre in '50s - The teenager from Winnipeg was an Elvis impersonator on the touring Hal Lonepine show. 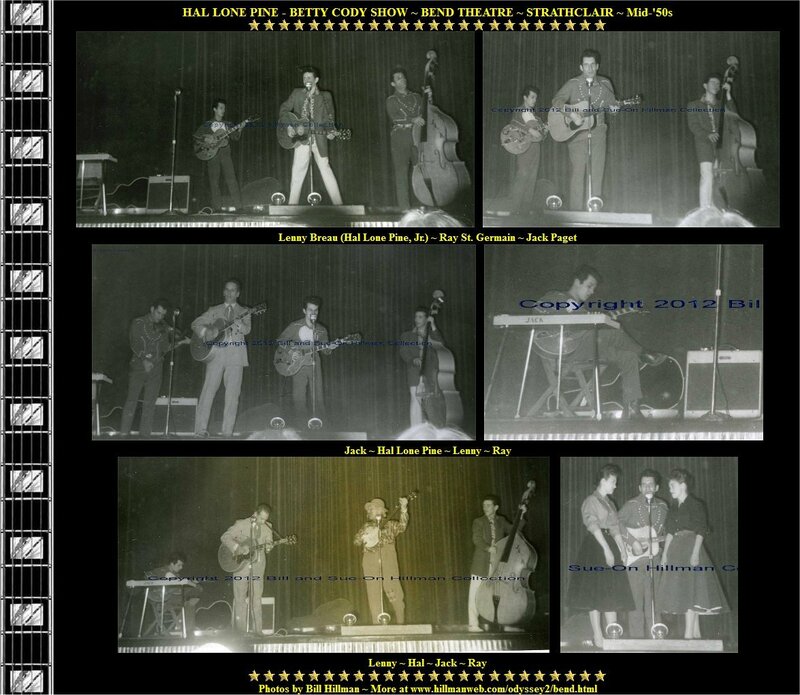 The young guitarist in the band was Hal Lonepine, Jr. who later gained worldwide fame as Lenny Breau. My two obsessions back then were Elvis and guitar. 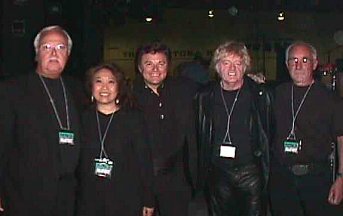 It was a thrill to finally meet Ray many years later when we were both up for the Manitoba Entertainers of the Year Award -- We won at the 1980 presentation. 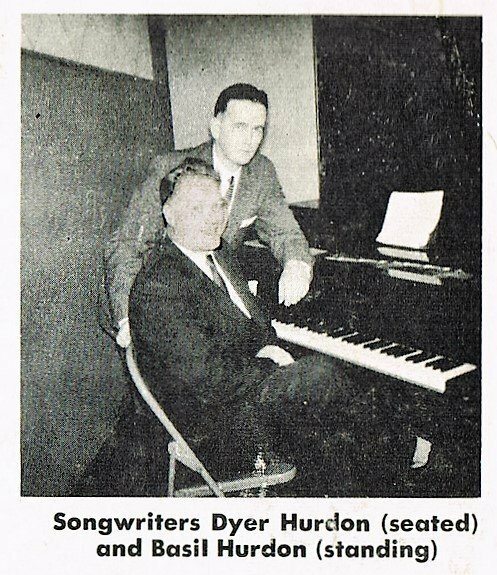 Our success in backing Newbeats and opening for Roger Miller and Everly Brothers in the Winnipeg Auditorium led to even greater gigs. 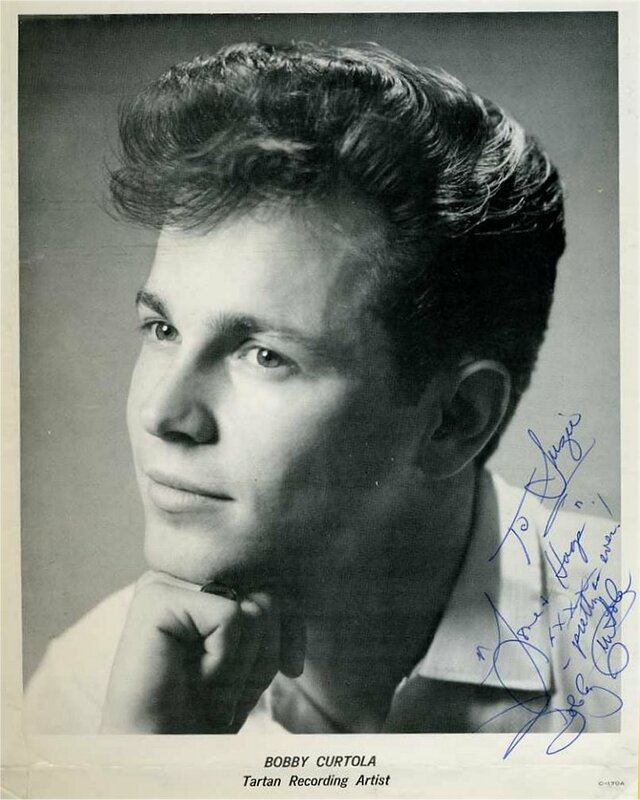 Most of Bobby's hits were written by the Hurdon Brothers of Port Arthur who discovered him at age 16 and managed his career. Mrs. Martell had small daughter, Ava, who grew up to become a beautiful lady. Bobby married Ava 10 years later. Bobby recorded in Nashville and the sessions were very professionally done -- many of them were produced by Ray Stevens. Top session musicians and the Anita Kerr singers were on the sessions. These sessions turned out a long string of hits -- both nationally and internationally. By the time we did the tour he had a good number of hits to draw from. 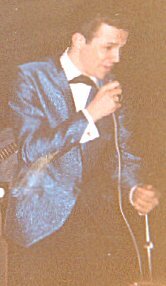 He had all the right stage moves, well dressed and groomed and was always in good voice. 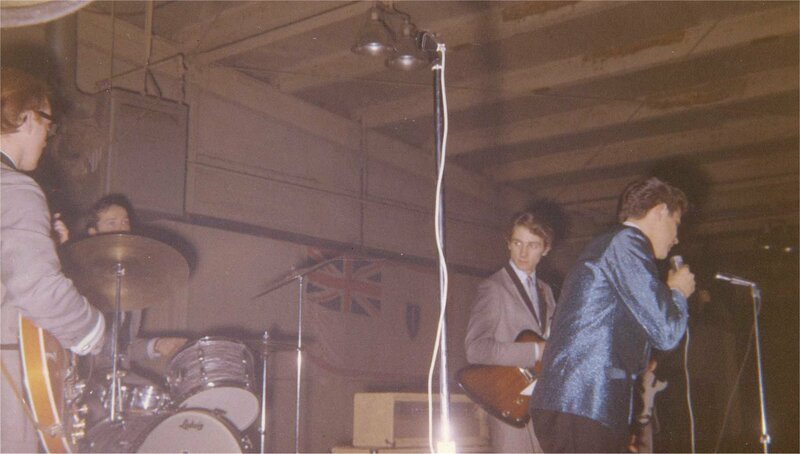 We were met with packed houses and screaming teen fans at every venue. Bobby was a terrific role model and fans and parents alike adored him. 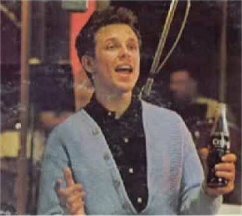 Bobby had written and performed the song "Things go better with Coca-Cola" in 1964 for their ads and he also served as a pitchman for the company. In fact he was also given a spot in the Coca-Cola Museum. Since Coke were a major sponsor, there piles of cases of Coke in our trailer and on and backstage -- The only "drug" that was ever touched on the tour. A U-Haul trailer carried the PA and our equipment which included my Gretsch guitar and Fender Twin Reverb amp. 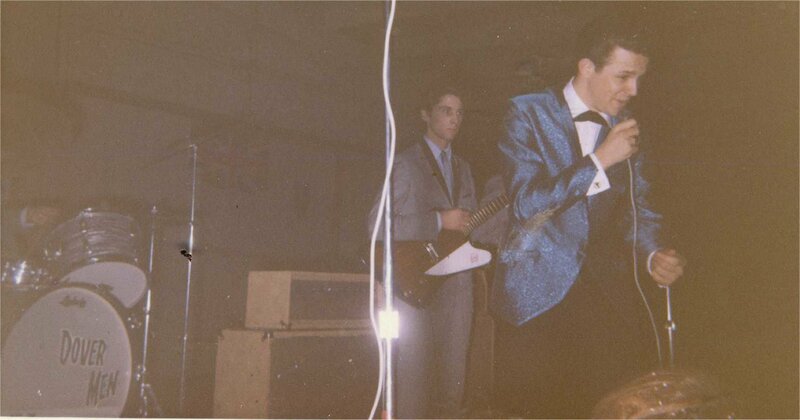 We opened each show with guitar instrumentals and hits of the day and then brought Bobby on to screaming applause. 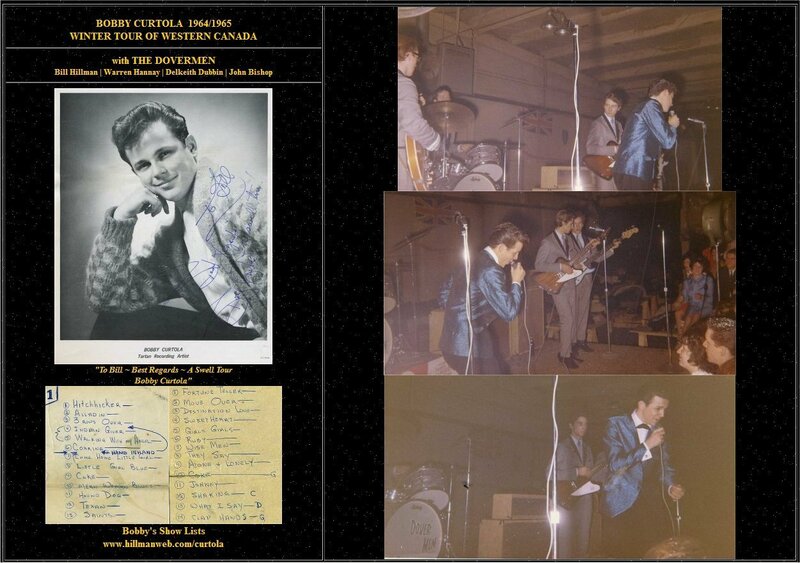 Part of our '64/'65 tour with Bobby. A few months later in Spring 1965 I took my fiance Sue-On on a date to see and meet Bobby when he played in Minnedosa. We had a good chat backstage and he gave autographed photos to each of us. Sue-On was impressed when Bobby shouted "Hey, Red!" from the stage as we walked in the door. He had asked us to carry on to tour in US with him but I was going to University - other guys were starting careers. We had to turn down the offer - a very difficult decision to make. So eventually he asked another Brandon band, since he had good luck with us, his first Brandon Band. 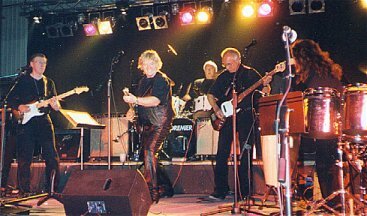 Brandon's Challengers went on to tour as Martells - a name that his backing bands were often given that was based on his manager's name. 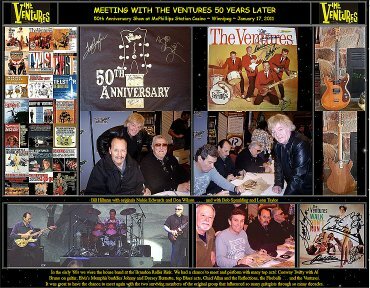 "To Bill ~ Best Regards ~ A Swell Tour! 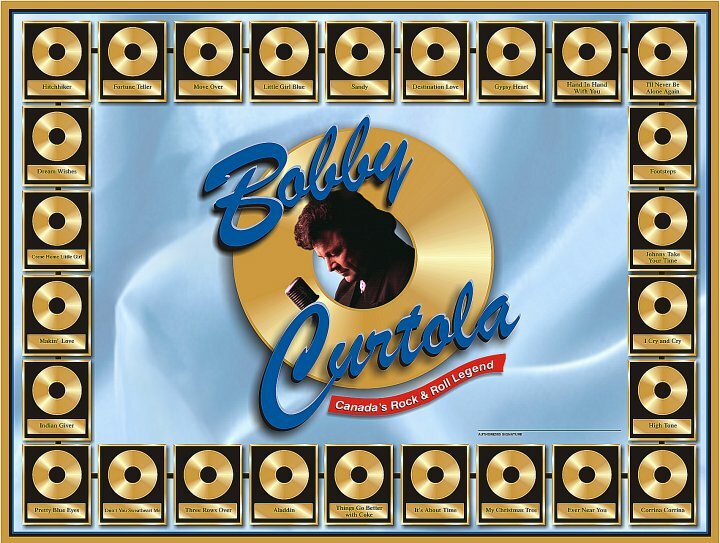 ~ Bobby Curtola"
"To Suzie ! 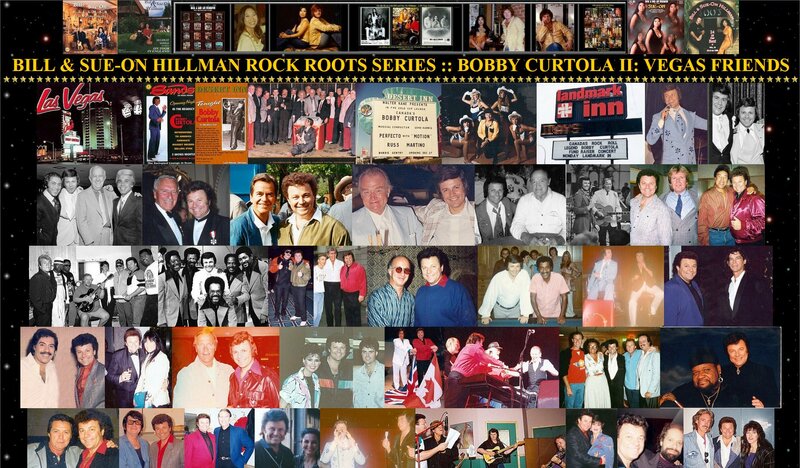 Love and Hugs xxxx ~ Pretty As Ever ~ Bobby Curtola"
After the tour we lost touch for 25 years. Bobby eventually became a popular longtime act in Las Vegas show rooms and lounges. In 1972, Walter Kane, who hired the entertainment for the Hughes hotels, signed him to a five-year multi-million dollar contract. 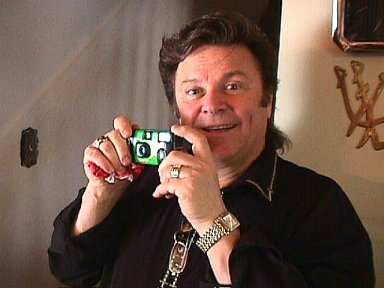 He was the first Canadian entertainer to receive such a long term deal in Las Vegas. Years later Robert and Bobby claimed that they had bought Vernon Presley's house behind Graceland - but lost it somehow. He married Ava in 1975 and they settled in Edmonton. Their two sons, Michael and Chris, were born and raised there. Starting in 1990 he played on the Love Boat for the Princess Cruises for 12 years. 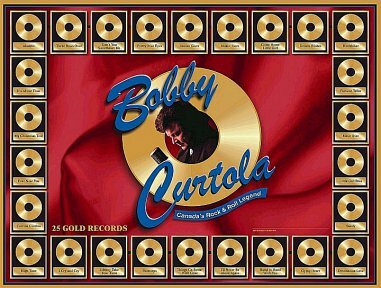 Bobby was a philanthropist, raising money for numerous charities, including his Bobby Curtola Foundation for Children in Ecuador. He also received Canada’s highest honor, the Order of Canada, and the Gold Medal of Merit in 1998. 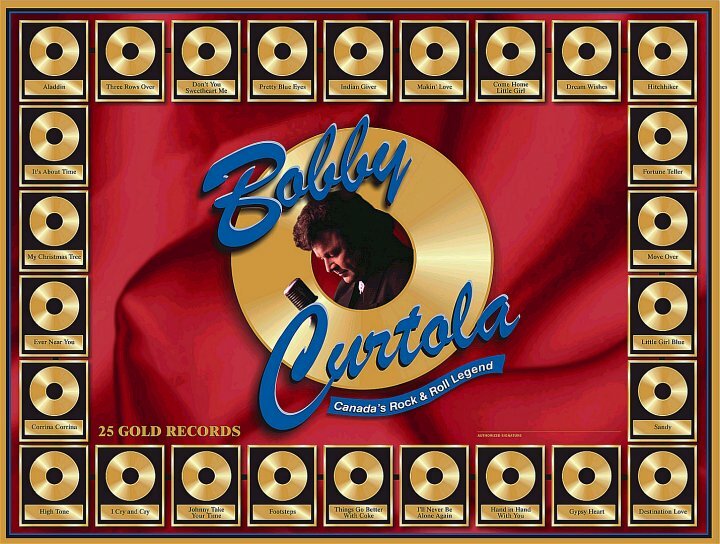 There is also a street named after him in his hometown called Bobby Curtola Drive. 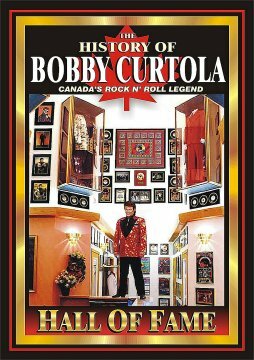 He received many awards for his music and his charity work, but somehow he was slighted and never entered into Canada's R & R Hall of Fame. One evening Sue-On and customers noticed a big Lincoln with Elvis plates parked out front of our SOO'S Restaurant on 10th St. Brandon. They were in town to scout out an unfinished truck stop development along Trans-Canada highway. Bobby wanted a '50s style diner and truck stop in the yet unfinished structure. Two mafia type guys in black with earbud phones entered and were ushered to more private room in the back. A customer said he thought it was Bobby Curtola. Sue-On had met him 50 years ago but it was too long ago to remember. So she sent Barry Forman's Sister-in-Law who was working for us -- to ask if he was Bobby. She said my boss played for you on tour. Sue-On called Bill to come down to join our guests. 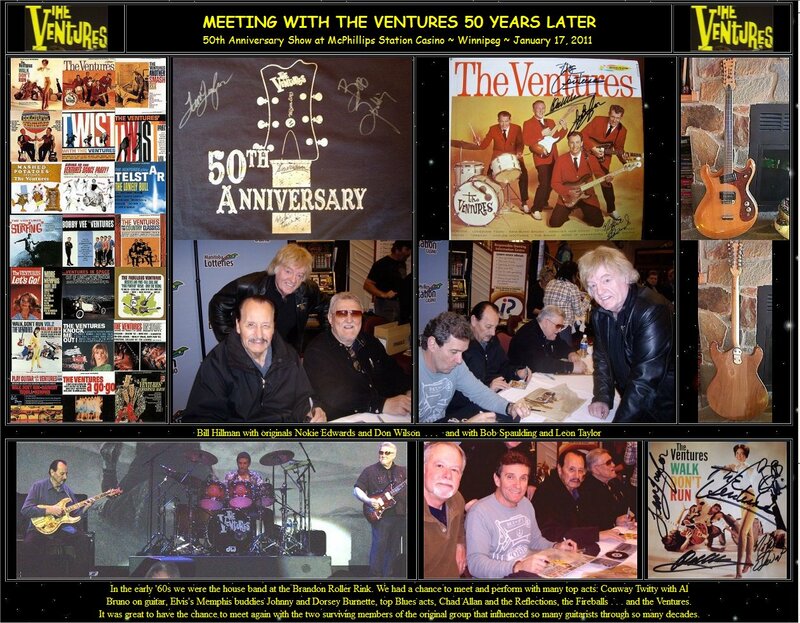 They talked old times and Bobby presented us with merch: book, CD, photos, etc. This was the start of a long reunion and four year association after they moved to Brandon. A short time later they moved to Brandon to construct and promote a water purification system. They had a Hutterite colony manufacture this large unit that could turn dirty sewer water into drinking water. They formed a company called Home Farms. The invention and business venture looked promising with contracts in US but failed when US and world economy took a nosedive. Robert was a character - and he had many colourful stories about their many deals and investments. There was a Caesar cocktail called SeaCza, bottled water, CDs, booklets, property, the headlining of ocean cruises, etc. There were stories of owning Vernon Presley's house behind Graceland . 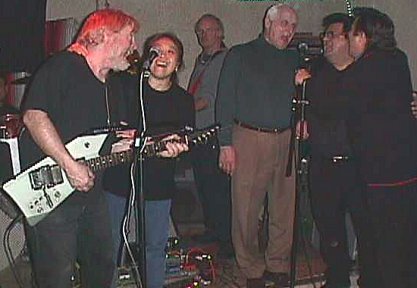 . .
Robert had married an Indonesian girl and built a mansion over there, but she and the kids were with him in Brandon. 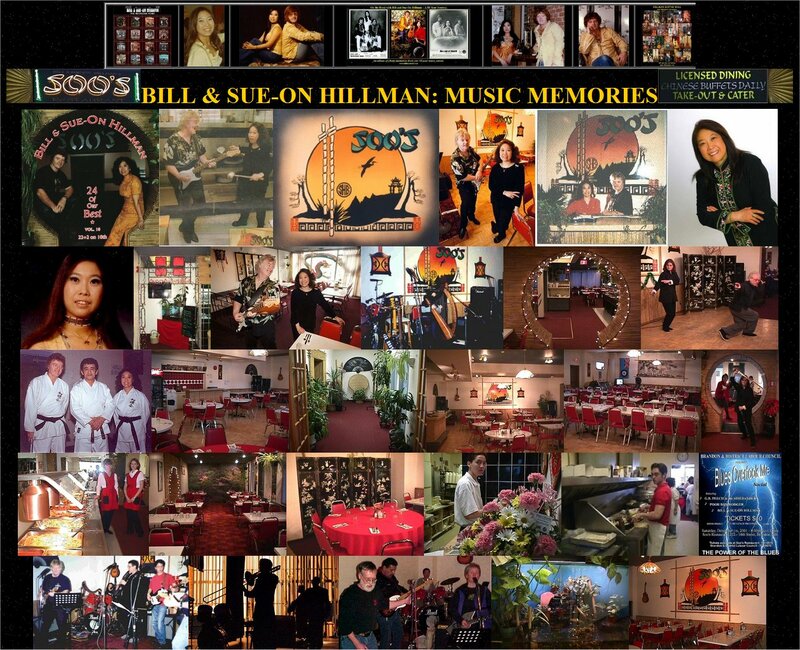 During their years in Brandon we had many get togethers at our house - birthdays - events - dimsum. 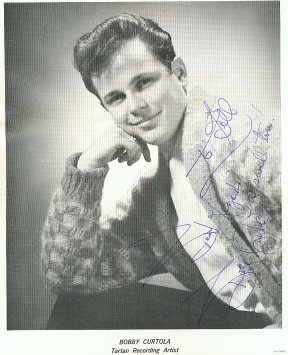 Bobby lived in a mobile home for a while in Brandon. When they bought Kadambi's Office complex mall on 18th Street, part of it became Bobby's office and career museum. Bobby moved into the upstairs suite in the complex. Bobby shared many CD booklets, posters, clippings, notes, etc.  for the Website I created. Unfortunately, business difficulties arose and he moved East before we could finish these projects. During Bobby's stay in Brandon I was hired by Brandon University to teach three sessions in Pukatawagan First Nation for 4 months. I flew home every 10 days and flew back after 4 days at home. 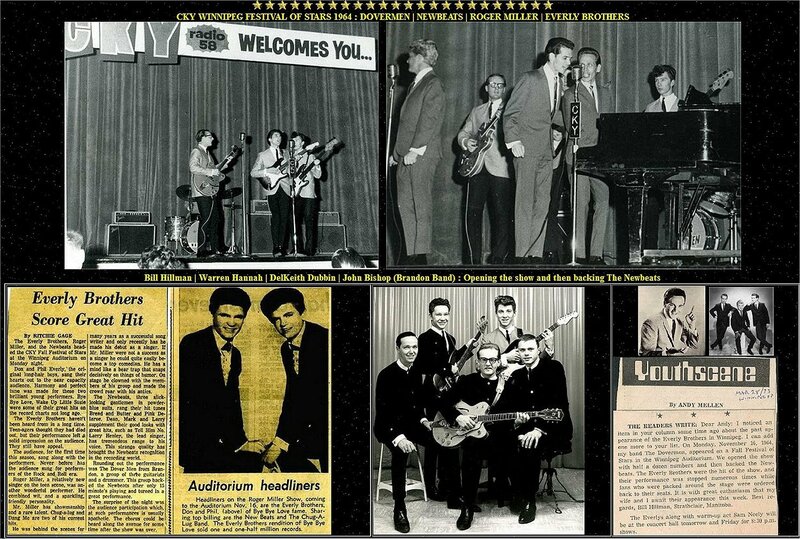 We planned a Sock Hop Reunion show during these trips home. We rehearsed there for the Sock Hop show. It was a huge sellout crowd - there was great response. We - The Dovermen were first band he hired out of Brandon. 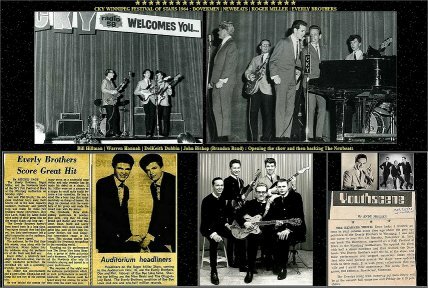 Another Brandon Band: The Challengers toured as the Martells backup band named after manager Marie Martell. The support act was Ray St. Germain - a great reunion in itself. 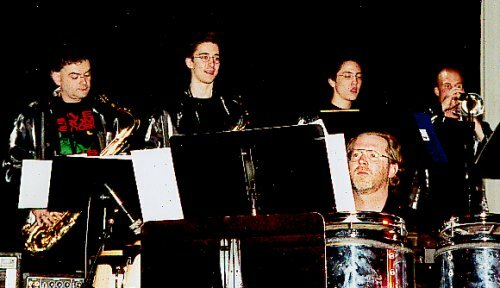 he enlisted some of those band members, including Scott Grills Dean of Arts, to form a horn section for Bobby. 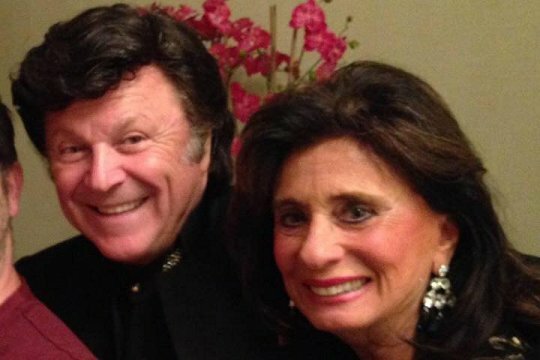 Back-up singers were Bobby's wife Ava, Birdie, and Robert's wife Wulan. 30 of my BU students from Puk heard our NCI radio ads in the North and got excited about the event. Bobby and I gave them free tickets and they came down from Puk - Ice roads and Bullet Train - and then vans from The Pas. My students had worked hard at raising money for the trip: fish derbys, bake sales, auctions, etc. The rehearsal sessions had gone so well at the Cantina that we returned for jams. It was great fun jamming all the old rock classics . . . into the wee hours. Two of Bobby's business partners had joined us that night. The three of them gathered around one mic and were bouncing up and down to the beat. This was too much for the stage floor -- we heard a loud crack! Turning around we saw that Bobby and his buddies had fallen through the stage floor. They were still standing upright - but in a large hole in the stage. 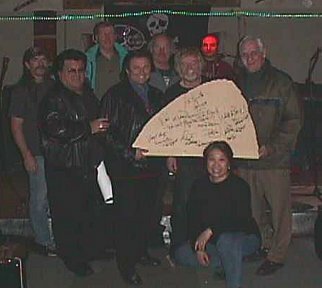 We all went into laugh hysterics, and eventually everyone, including Bobby, autographed the stage slab. The slab took an honoured place on the Cantina wall. 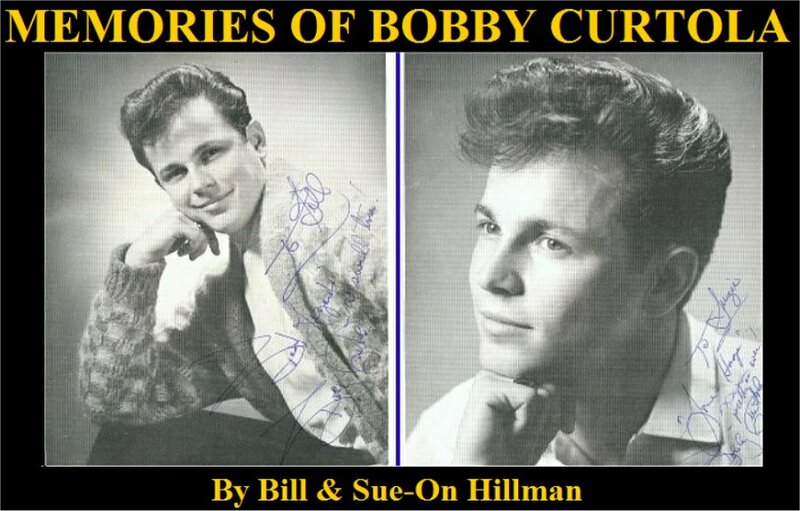 Bobby and Robert spent many hours scanning a large collection of Bobby's career photos. They passed them on to me I used them to help created a huge Website. 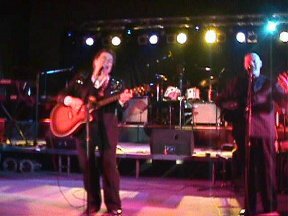 Sue-On's conga percussion had worked well at the reunion show in Brandon so she played the Casino gigs. Bobby put on his usual polished and entertaining show. We all stayed at a major Winnipeg hotel. 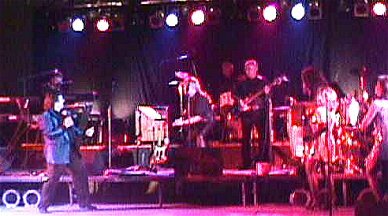 For a follow-up show the next year Bobby used a hometown Thunder Bay show band. When Ray St. Germain played a later gig at the Casino he invited Bobby and us as guests. We had a wonderful time visiting backstage and sitting in reserved tables in front of stage. Bobby had to make at least one visit to the Salisbury House for old time sakes to order a Hamburger Nip that he remembered so fondly. He started splitting his time among homes in Edmonton, Nova Scotia and Las Vegas. We kept in touch for quite awhile. Bobby sent many show pics and pics of the Liverpool home. He even made a few calls from Las Vegas - one time while celebrating out on the strip with the party goers. Another time he called about finding a new partner he was going to marry. Bobby moved to Edmonton in early 2016 after Rochford's death. 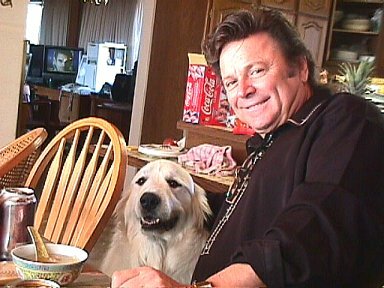 Half a year later we got the shocking news that Bobby too had died suddenly on June 4, 2016 at his son's home in Edmonton. We have many regrets that we hadn't gotten together at least one more time before he died. 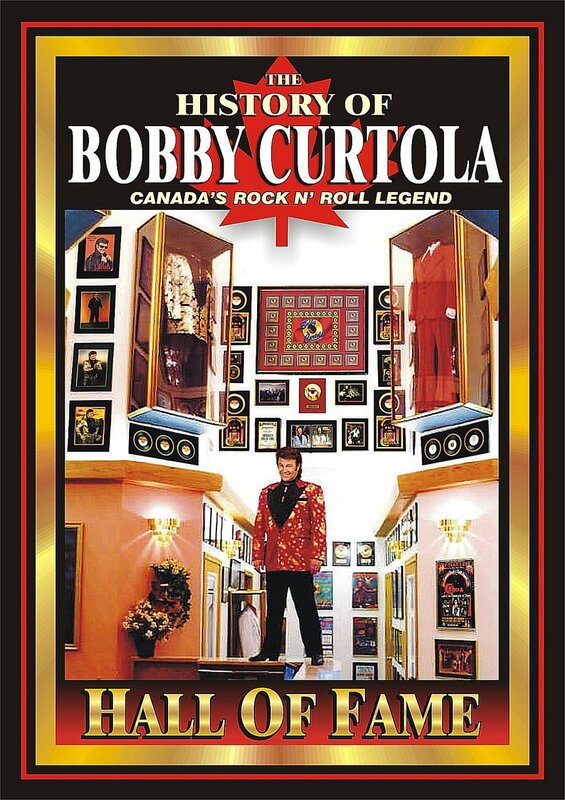 A highlight of our rock days in the mid-'60s was our tour as back-up band for Canadian teen idol, Bobby Curtola. 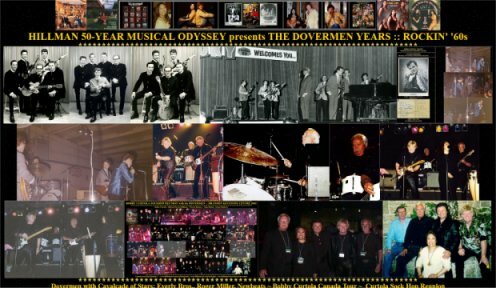 We started this a few weeks after our Dovermen performance at Winnipeg Auditorium where we opened for the CKY Fall Festival of Stars with headliners The Everly Brothers and Roger Miller. 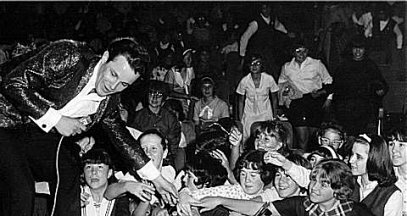 We had seen the crowd go wild for the Everlys and now on the Curtola tour we experienced more shades of Elvis/Beatles mania as teens packed every venue we played. The girls pushed in a frenzy against the stage trying to touch their idol and later to get autographs. This winter tour took us into Saskatchewan -- the Regina Armoury packed in the largest crowd there -- and east to Portage La Prairie. The most exciting date was in our home base at the Brandon Roller Rink -- on New Year's Eve. Bobby was about our age and was a super guy to work with. 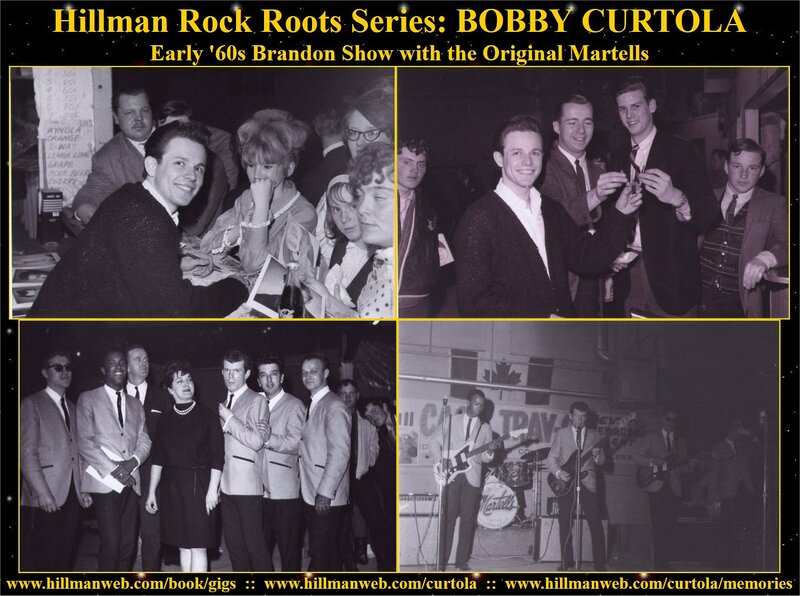 Bobby's manager, Marie Martel, ran the shows with an iron hand so things never really got out of control. 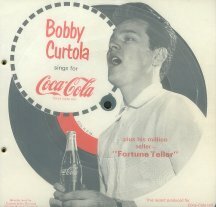 Bobby had sung some of the first Coca-Cola singing commercials (he is in their Hall of Fame), so Coke sponsored the shows and made sure there were always huge cases of Coke backstage. This was back in the days when ODing on coke had a slightly different meaning than it does today. 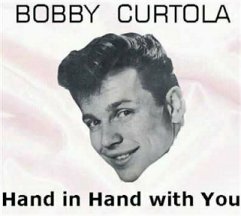 I saved the set lists from these tours, written in Bobby's hand, and they are featured on our Curtola Webpages. I had a reunion with Bobby 40 years later and those shows are also described on our Curtola Webpages and later in this saga. 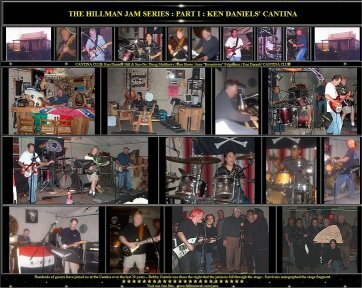 For many years now the regular house band for the Cantina jams has consisted of owner Ken Daniels (bass), Ken Storie (guitar), Doug Matthews (keys and guitar), John Fulgaris (drums) and myself (guitar). We have welcomed a long line of jam visitors over the years -- and even Sue-On (drums) and son Robin (drums and bass) have made numerous visits. Although we specialize in rock and heavy blues it's always fun when our visitors bring other styles of music to the jam and we've tried to make it known that visiting musicians from near and far are welcome. 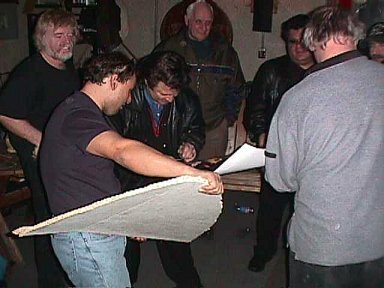 Ken has generously opened the doors to many other bands who have used the facility to party and rehearse. 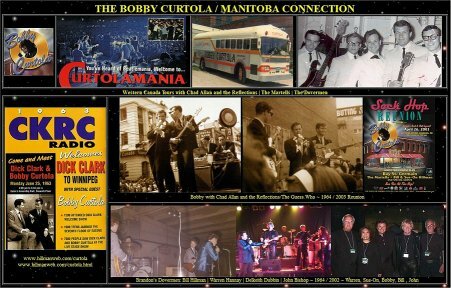 Back in the '60s I had toured as lead guitar player in Bobby Curtola's band and it was a real thrill when Bobby moved to Brandon for a few years in the early 2000s. We had some great chats about old times over many of Sue-On's special meals at our house. 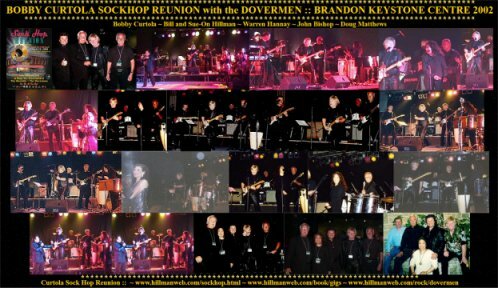 Out of some of our late night chats came plans to put on a rock 'n' roll band reunion at Brandon's Keystone complex. The natural place for us to rehearse was the Cantina. 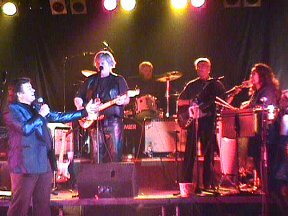 Two members of our old Dovermen band -- Warren Hannay (drums) and John Bishop (bass) flew in to do the show and we enlisted Cantina jammer Doug Matthews to play keys and Sue-On to join us on congas. We had a great get-together and the show played to a packed house. Around the time I was teaching Brandon University courses up North in Pukatawagan, Canadian pop idol Bobby Curtola moved to Brandon, where he sank roots for a few years. 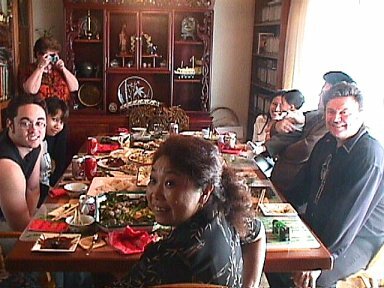 During that time we got together many times, chatting over Sue-On's home-cooked meals. 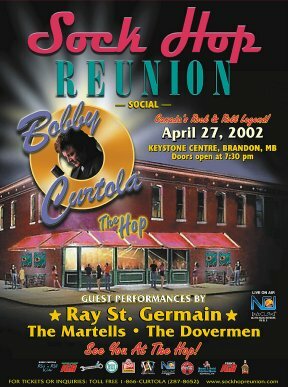 Since two of Bobby's back-up bands from the '60s had been from Brandon: our Dovermen and The Challengers (renamed the Martells while on tour), we planned a "Sock Hop Reunion" Show at Brandon's Keystone Centre. My students in Puk heard all the radio promos and all 30 of them started to raise money to attend the show and see their old prof in action. They held money-making events: fish derbies, bake sales, garage sales, raffles, etc. I sweetened the pot by giving them 30 complimentary show tickets courtesy of Bobby. 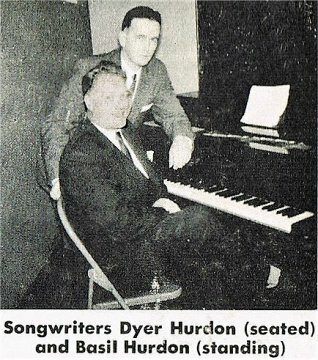 On the day of the show they took "The Bullet," a slow train to The Pas (spring weather had made the winter roads impassable). At The Pas they crowded into vans to complete the trip south to Brandon. The show was a sell-out and it was a treat to see my Puk friends reelin' and rockin' near the front of the stage all night. 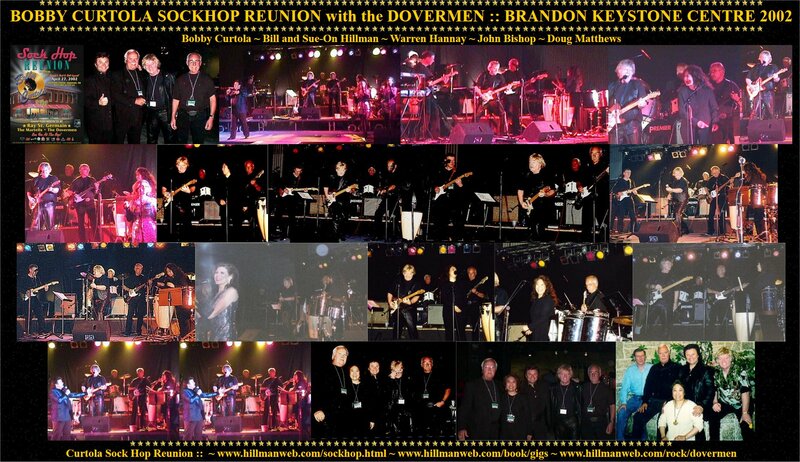 Our original band members, Warren and John flew in for the reunion gig and my jam buddy Doug Matthews played keys. Sue-On rounded out our sound by joining us on congas and vocals. I had to make the trip home from Puk a few days earlier for press and radio interviews and to help with the planning, but ran into a major problem. A blizzard hit. My teaching stint at Puk had just ended and I had to get home. All flights out of Puk were cancelled. A few of us managed to talk a daring pilot into flying us into the teeth of the storm to reach The Pas for a connecting flight where the weather had cleared a bit. The Pas has two airports and after a white-knuckle flight we landed at the one miles from where the departing plane was waiting for me. 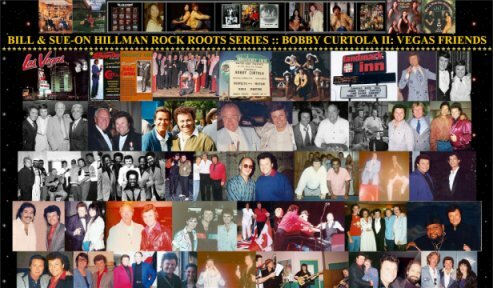 OFFICIAL RELEASE OF BOBBY'S DEATH FROM HIS SONS It is with heavy hearts that we confirm the passing of our father, Bobby Curtola. 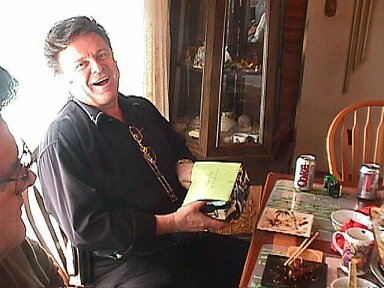 He was an amazing man who did so much for the people in this world, but even more as a father, uncle, godfather and Nono. His entire family requests privacy at this time while they grieve their loss.